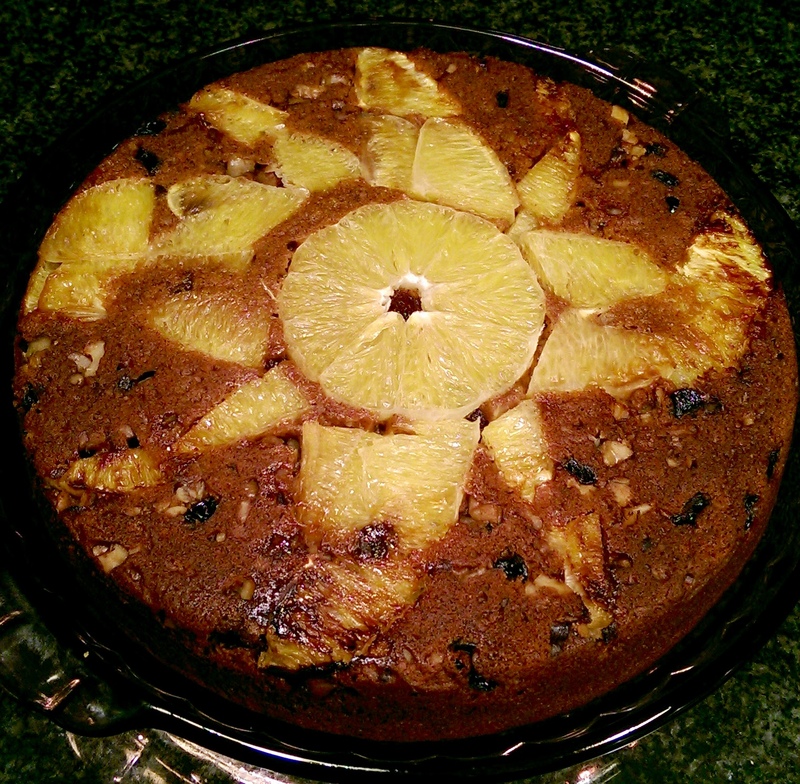 This tasty spiced orange upside down cake with a galactic theme was baked by the Zooniverse’s very own Julie Feldt. Follow her recipe below to make your very own! Directions: Pre-heat oven to 350 F / 175 C. Grease the cake pan well so cake will release easily later. Zest the orange into the wet ingredients bowl, then remove the peel leaving the sections intact to each other. Cut a 1/2 cm cross-section slice from middle of orange (perpendicular to the orange sections). Slice the remaining sections and arrange in a spiral galaxy pattern in the cake pan. Sprinkle raisins and walnuts into pan, they act as additional flavors as well as background objects and dust in your galaxy. Set a side. In the mixing bowl with the orange zest, whisk together the buttermilk (or non-dairy buttermilk option), oil, applesauce, maple syrup and vanilla extract until smooth. In a different mixing bowl combine flour, baking powder, baking soda, cinnamon, all-spice, nutmeg, ginger, and sea salt. Add the liquid ingredients to the dry ingredients. Fold the batter until it’s just combined, ensuring not to over mix it. Pour the batter over your orange galaxy pattern slowly to ensure the slices do not move around in the pan. Bake for 20-25 minutes on the centre rack of your oven. Cake is done when a toothpick comes out clean from the centre of the cake. Transfer pan onto a wire rack and allow to cool completely before flipping. Run a knife alone the sides of the cake to help it release from the pan. To flip, place a large plate over the cake pan and flip while holding firmly onto the pan and plate. Gently lift pan from the plate to reveal your galaxy pattern. If you cake has not released from the pan, return it back against the plate and gently tap the pan and plate together on the counter until the cake releases. Enjoy the galactic deliciousness and Happy Holidays!